Truth to be told, I'm not in the mood to blog today. As much as I don't want to admit it, I would be rendering the same sad and pathetic words. I have been saying this for the last weeks to months. I'm not at my best now. Pardon my repetitiveness but life has been testing me to the fullest. I've been trying to find the road to escape but somewhere along the way, my path has always been blocked with additional challenges. And because I have not been emotionally well over the past week, even the littlest things are testing my patience. I can't wait for the day when I could finally say, this is over! Meanwhile, here are a few beautiful things that made the past week. I almost thought I wouldn't be able to write and share anything good this week. This house! I mentioned this in one of my previous Sunday post. I had the chance to be in the place again. I was able to get a better capture of the front gate and the mailbox :). To the owner of the house, apologies if I've been stalking and taking photos. No harm intended, I cannot resist admiring your beautiful home. 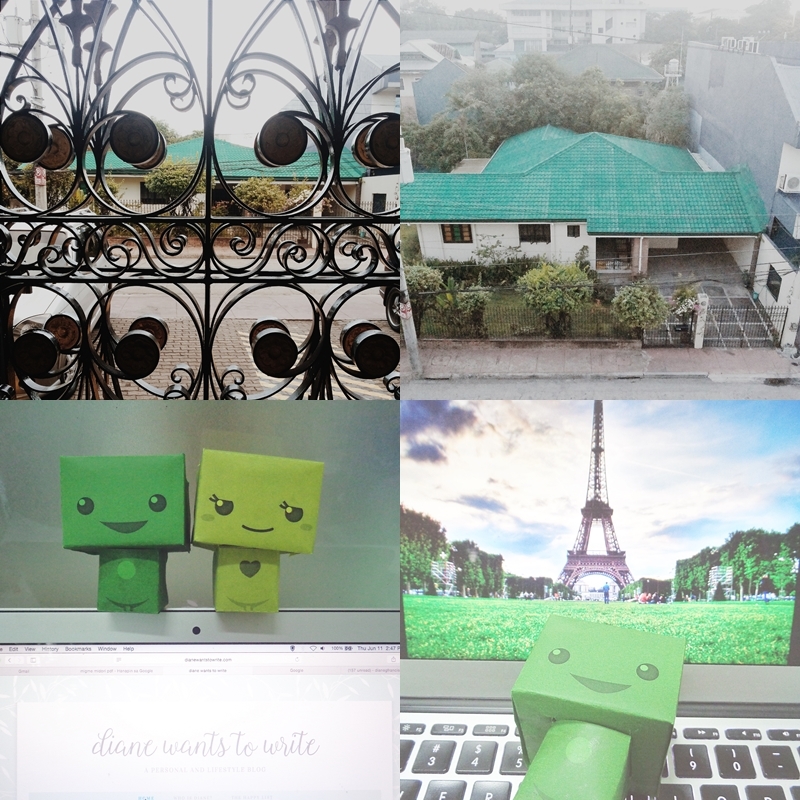 And part of me is wishing that the owners will land to my blog one day. 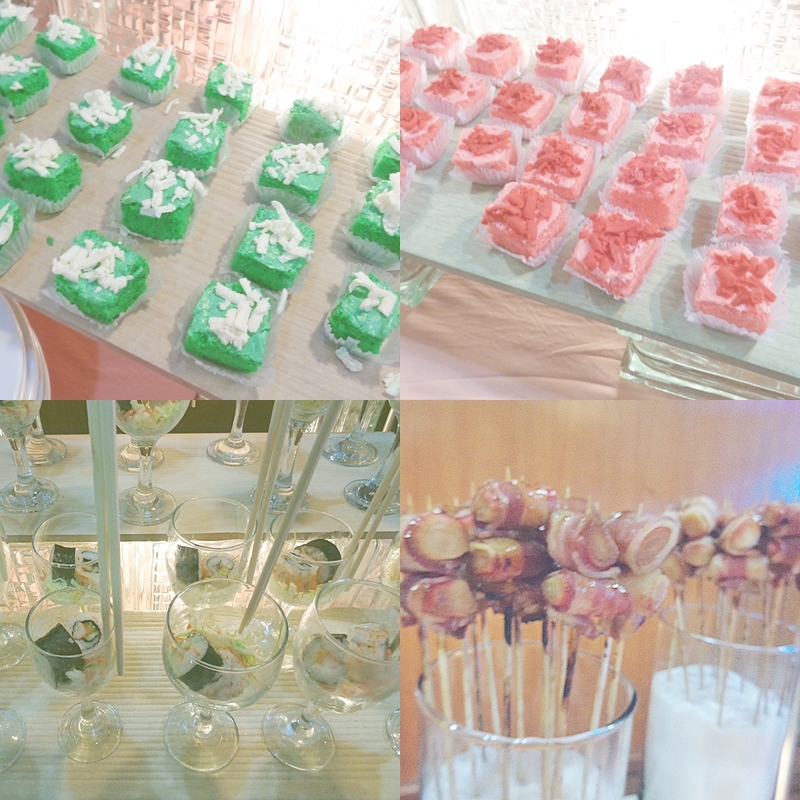 The only thing that can probably make me happy :) - More desserts, California Maki served in wine glasses and crab sticks wrapped in the holiest oiliest BACON! We gatecrashed a food tasting event. Hahaha How often do you eat the best meals for free? 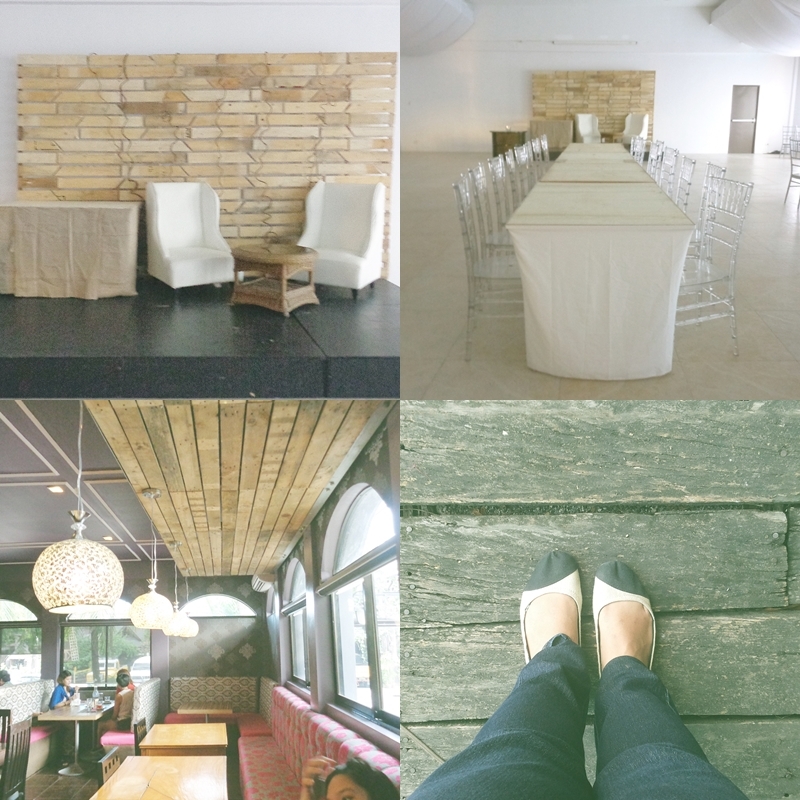 Best about everything, everything was served in this beautiful venue. 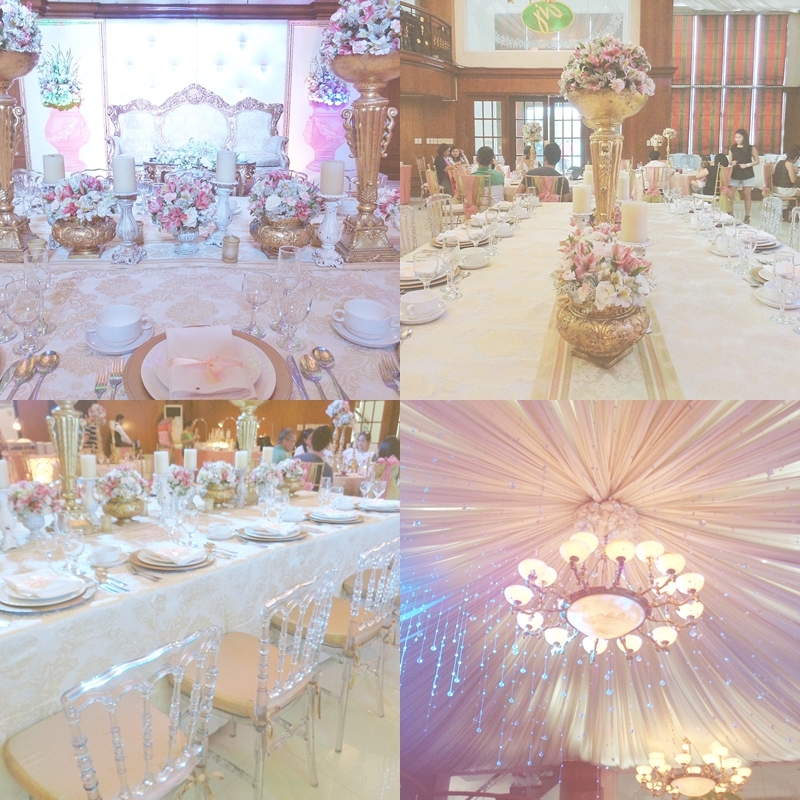 I may not be the biggest of fan of pinks and heavy decorations but everything I see here are eye candy. Fresh flowers, ghost chairs, the tear drop lights and best of all, the great food! I just made another lousy post. Sigh. Give me a few more weeks, I'll do everything to feel better. Weekend Rain and Misty Windows - This weather! 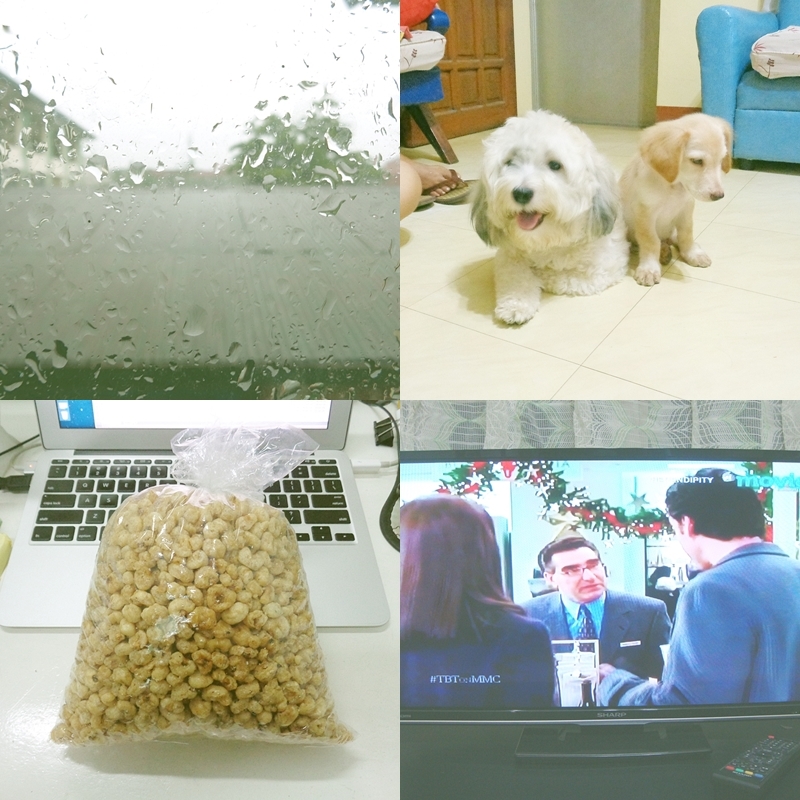 The rain and the colder weather gave me more reasons to appreciate this weekend at home. A few of my colleagues reported for work for a major event. I may have failed to witness a significant milestone at the workplace but weekends like this? There's nothing to regret about spending a quiet and relaxing weekend with the family. Grey and Bailey - #StopYulin I cannot understand how some groups can find fulfillment in slaughtering helpless dogs and cats. Even Pope Francis posted the stand of the Catholic Church. Define weekends - A bag of chicacorn from Binondo is another sinful way of spending weekends with the family. Belgian Waffles! - I got this as soon as I saw it in the rack of the nearby 7-11 store. My verdict though? Too sweet for my taste buds. 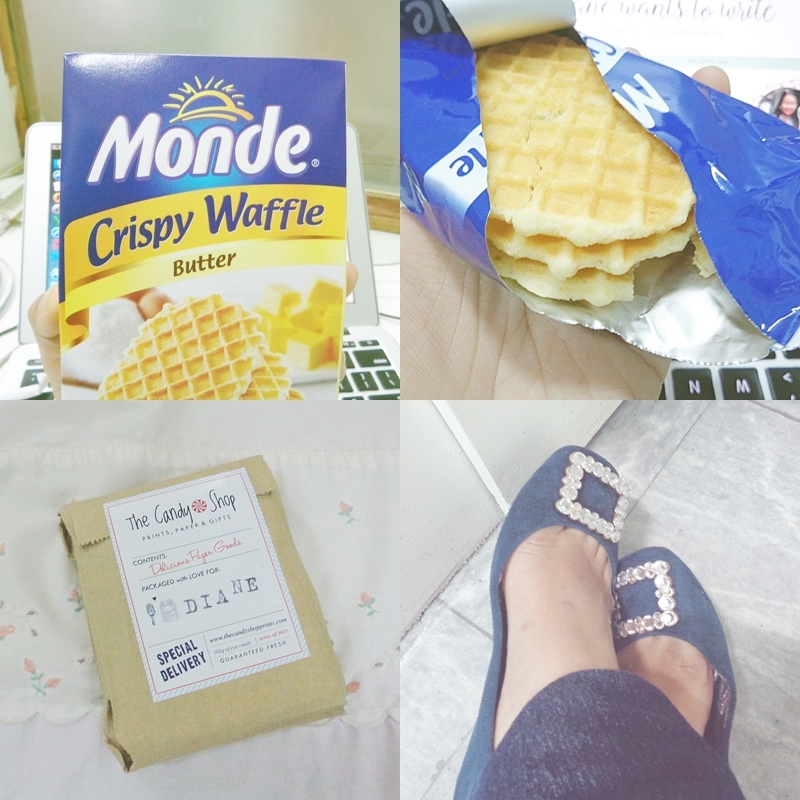 Something from the mail - Thank you The Candy Shop for making me happy even just for a while. While waiting for my Roger Vivier ... - Hahaha Aside from Valentino's rock studs, I've been dreaming of owning a pair of this ballerina flats. While everything is still a work in progress, I settled to this pair from Staccato. The family that eats together, stays together - This was thanksgiving lunch with the family a few days ago. My cousin who was mistakenly diagnosed with a serious heart ailment has been healed through second opinion. Thank you for leading our family to a smarter and better cardiologist. The photos were taken from my friends recent trekking experience to Mt. Pinatubo. I lent my camera and sought permission to publish these photos. The majestic Mt.Pinatubo! The volcanic crater that turned to a beautiful lake years after. Give me a few more years to shed off my lbs :), I will have my own Mt. Pinatubo experience. Ever since I opened my own eBay shop, I have been a constant client of most shipping companies. My usual shipping partners are LBC, 2Go and JRS (Sorry Leah and Mother E hahaha). I go to LBC when I need to expedite and send something relatively expensive and don't have time to drop by the nearby mall. Setting aside the little expensive fee, I feel complacent whenever I use LBC. On some days, I opt for JRS whenever I'm sending something heavy and bulky. Why? They have bigger pouches. :) Added to this, the cut off time for JRS was the latest, compared to the other shipping companies. They accept parcels for next day delivery until 7 pm. Most of the time though, I use 2GO. It's cheaper than LBC and near my workplace. They don't have long lines as compared to LBC and JRS. Customer service is also great! When I started selling in eBay, I enjoyed those short and meaningful conversations with their lone employee. When I introduced myself as a part time college instructor, I discovered he has intentions of becoming a teacher. 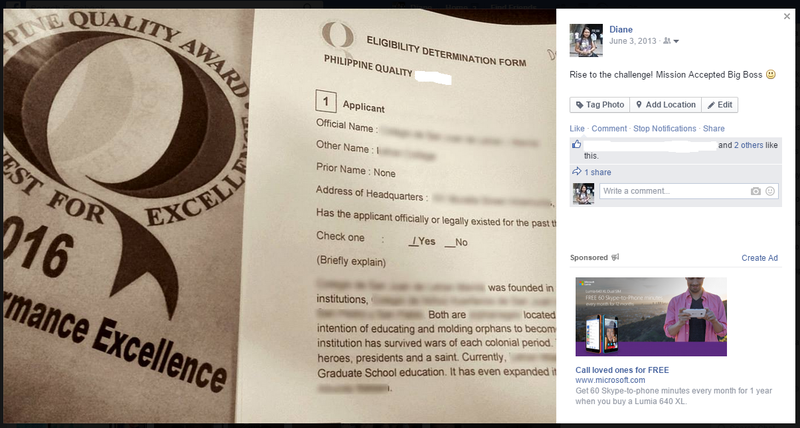 He has plans of pursuing a masteral degree and I gave him advices from my personal experiences. The best part of our conversations, we share the same opinions about the contestants of the local franchise of The Voice. Haha More importantly, I never had horror stories about packages lost or damaged. Suffice to say, I admit that 2GO has been my favorite shipping service provider. A few weeks ago, I was about to email 2GO to express how I'm satisfied with their services. It was my way of rendering my gratitude, especially to their hardworking employees. As someone who handles customer feedback from my day job, I equally feel frustrated on complaints and negative experiences. Of the 10 survey questionnaires I encounter, I'm quite lucky to read one commendation. Having this experience, I make it a point to report my positive customer service experiences. I take this seriously, because I wanted to ensure that deserving employees are recognized. Before the long weekend, I went to 2GO's SM Manila branch. I thought I will have another fast and easy transaction. Turns out, the lone staff went for a break. (I assume) This was around 6:30 pm. This was not the first time I encountered this practice from them. I was actually fine with this. I was willing to wait knowing that most of the time, there's only one employee who handles the branch. I waited for around 15 mins. No employee showed up so I decided to attend to my other errands. One thing I noticed, the previous employee who handles the branch used to provide the exact time of his return. I returned to the branch after 30 mins. The branch was still empty. I decided to wait with two other male customers. The other customers left after a while. I stayed for around 30 minutes and my patience was starting to diminish. I checked out the nearby LBC branch. I was willing to pay more for the sake of convenience. Unfortunately, the LBC branch is no longer accepting customers. Sigh.. 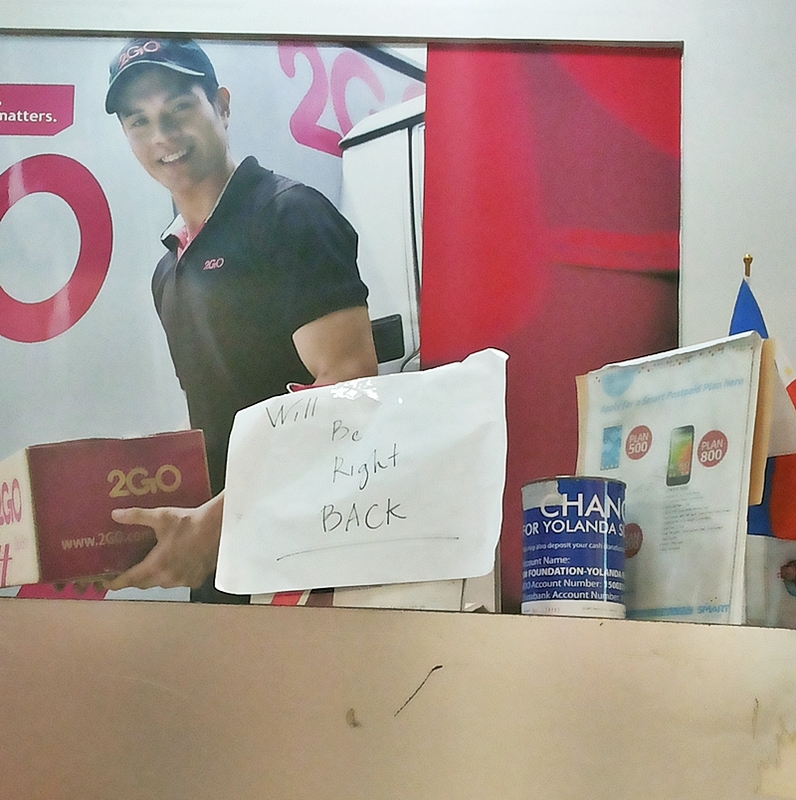 I returned to 2GO and much to my surprise, the branch was still empty. I waited for another 30 mins., no signs of any staff. I noticed the two CCTV cameras installed, I hope it was really working. If anyone from 2GO can read this, you can verify my presence on June 11, 2015. I was the lone client who patiently waited. During the entire time I was waiting, the branch telephone was continuously ringing and worst, an electric fan was left working inside the employee's service area. I left around 8:30 pm. Frustrated and disappointed. Leaving the branch unmanned for more than an hour was a lousy move. I reported my experience through 2GO's customer contact form and their Facebook page. As of date, I never received any response. Because I need to send the package before the long weekend, I decided to rush to the nearest JRS branch. Never mind the frightening streets of Recto and Avenida. I arrived at JRS's branch around 8 pm and thank God! The employee accepted my parcel even if it was nearing closing time. Thank you JRS for saving the day. As much as I don't want to admit it, it looks like JRS is starting to impress me. As for 2GO, a simple apology reply to my message can work for me. I hope it would not be a template-ish reply though. For now, I'm convinced that I should ship my packages through LBC or JRS. I'm alive and surviving! I may not be at my best now but there are just some good things that happened along the way. That task I never wanted to do is finally done. It happened in the beginning of the week and the vacation leave the next day was one of the best decisions I ever made. It came in perfect timing because it was also my mother's birthday. 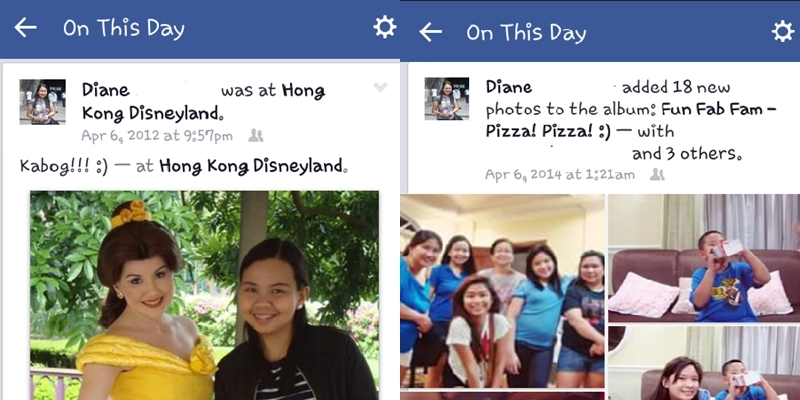 We celebrated it with pizza, pasta and honey barbecue chicken wings. Hooray for celebrations and vacation leaves spent with the family! 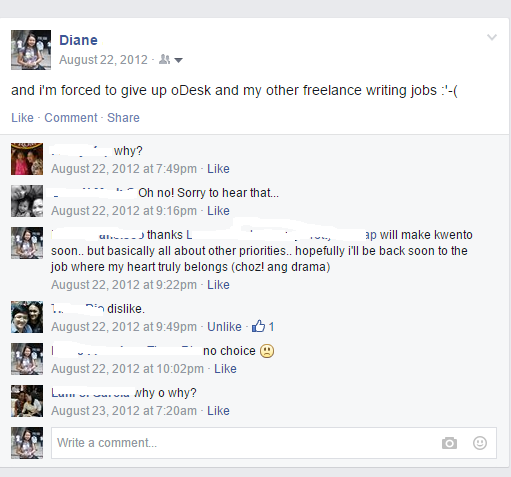 In the course of my short lived leave, the desire to build my career in freelancing dawned on me again. I'm beginning to feel that I'm more productive at home. They always say that work should be separated from home. Some people also find it hard to gather their working pace at home. In my case, I believe I'm beginning to become an exception. It's true that it's more tempting to sleep, eat and become a full pledged couch potato. I can feel the temptation but apparently, I discovered that once I gained my working pace, I'm like a well oiled machine. As proof to this, the 160+ pages report I've worked during my mandatory leave was completed in a week. If I did the report in my workstation, I would probably need more weeks to complete it. If I'm more productive at home, I might as well take advantage of this opportunity. However, this decision will not happen in the near future. This requires extensive planning, savings and more considerations. The title of this post relates a historical street in Manila. I feel that I have written a long introduction that somehow diverted the real intention of this post. 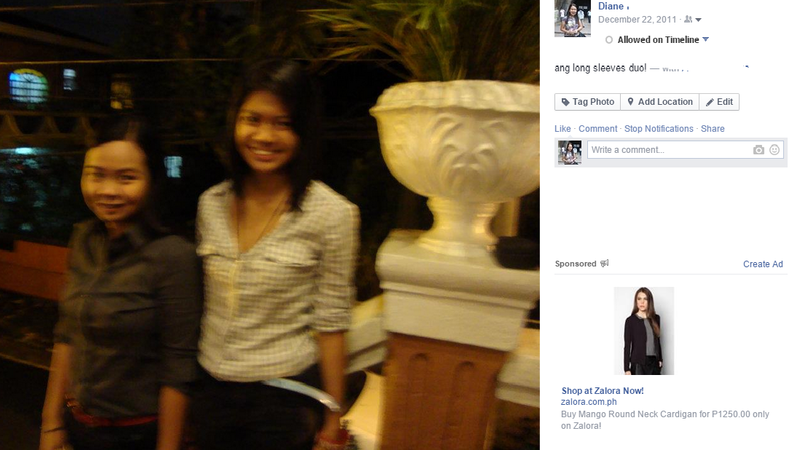 Hahaha I will not discuss anything about Escolta's history. Use Google and Wikipedia, they are more reliable than me. Hahaha Escolta is a very prestigious street during the old Manila times. It used to be one of Manila's central business district. Most of the people who frequent the area are businessmen and the well-to-do people in the society. 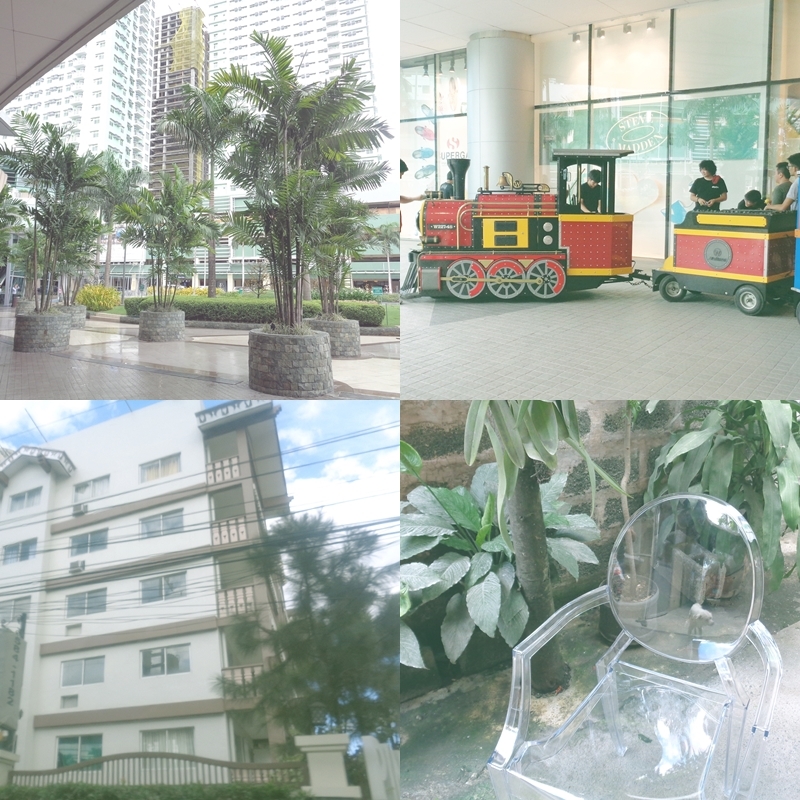 It can be compared to Ayala Avenue, US's Wall Street, or Hong Kong's Central and Canton Road. But that was many decades or almost a century ago. 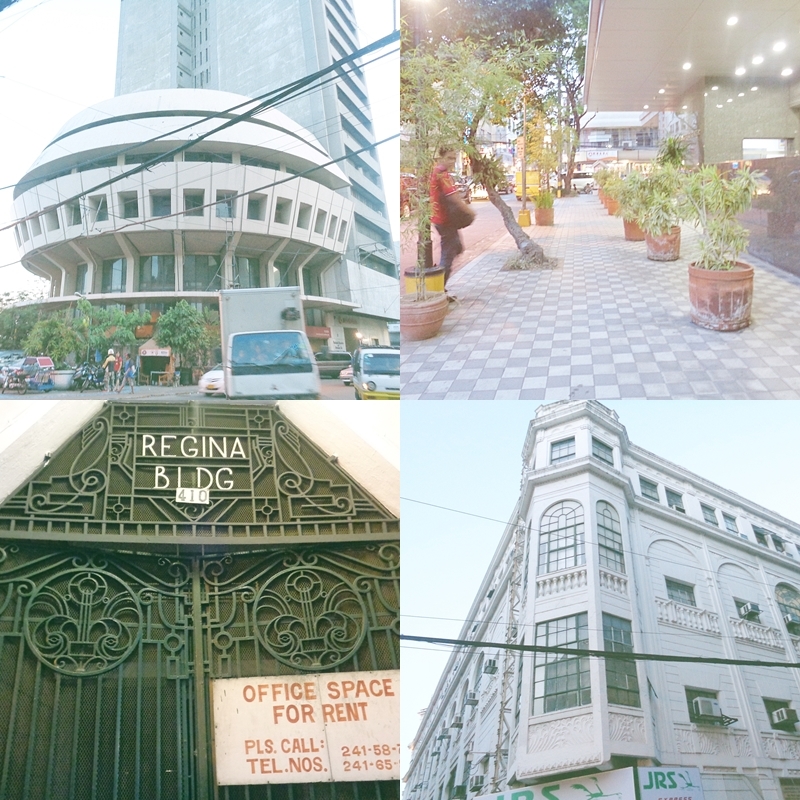 Today, Escolta can be considered as an ordinary historical landmark in Manila. Unfortunately... Escolta is still a home to many businesses and Chinese restaurants. 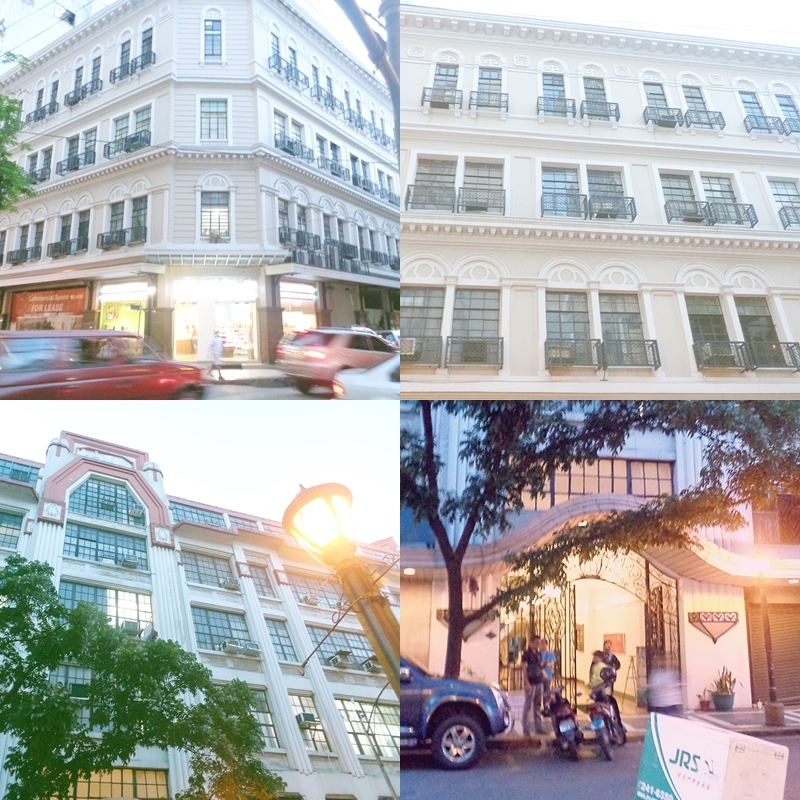 But for old souls like me, Escolta never lost its beauty and charm. Annoying problem, how to erase those stubborn electrical wires? AIC Center - The dome like building houses banks and other small scale companies. A little clean up and maintenance, the building look better. It can outshine those modern buildings in Makati. Rare modern building in Escolta - I forgot the name of the building but this was the lone modern structure I found in the area. Natividad Building - This has to be my favorite! Everything about this building is perfect. 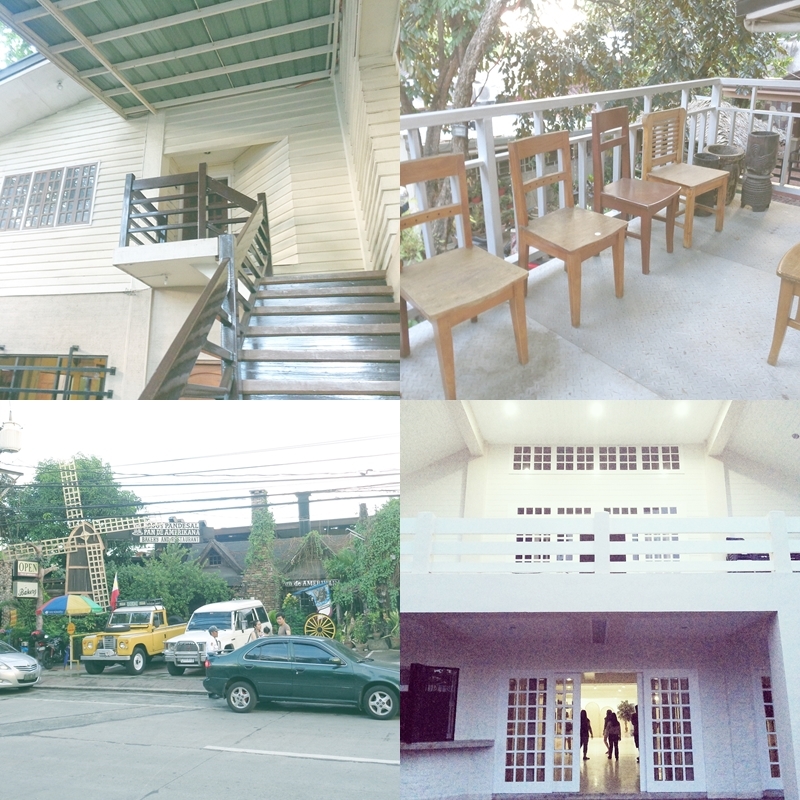 Although it was already renovated and restored (I guess), Everything about it is so lovely. If I remember it right, the building used to have shades of cool green and cream. First United Bank Building - Another equally beautiful building. Although what I love best in this building is the front entrance. The intricate design of the old metal gate. For me, it looked like on those elegant apartments featured in US NY based movies. A little inspirational reminder :) Yes, in His own perfect time, everything will get better. On the way home a few days ago, I had this realization with my friend MFA. When does a secret remains as a secret? If I revealed the secret to a friend or a group of friends, how long will it remain as a secret? How many people should know for everything to remain as a secret? Apparently, there's no head count needed to ensure the preservation of a secret. MFA and I agreed that more than the chance of revealing the secret, we lose control over that hidden piece of information when we decide to spill it to someone else. That someone else does not require a head count. One person is more than enough to cause some ruin or worst comes to worst, a chaos among the people involved in the secret. A few months ago, I became a victim of this realization. MFA also had her share of experience. This a proof that MFA and I are indeed friends. We share the story. We share the misery. I wouldn't discuss the case of MFA. Her story is harder to explain because there was a third wheel in the story. Guess who? Facebook! Hahahahaha Most of you are probably aware of how one status message, photo or the restricted access feature can ruin even friendships built for years. Another, hahahahaaha! My story is likewise quite complicated to explain. It involved several people within my immediate working environment. Bottomline, I revealed a set of criticism pointed to my friend BKK and her other friends. My intention was to warn BKK on how people perceive her. I wanted BKK to become aware. BKK deserves the truth and being her friend, I felt obliged to do it. I told her to become mum about the criticisms I heard. Unfortunately, BKK ruined my concern. Turns out, BKK spread my message to her other friends. The other friends were fuming mad and as you can sense it, chaos happened. BKK's other friends were able to track my sources. There were confrontations made. Hurtful status messages were later posted in Facebook and Twitter. On my end, I felt the need to talk to BKK. I wanted to backfire with my own version of confrontation. BKK was quite lucky because I had other serious problems when everything happened. I expressed my disappointment to BKK through an SMS. We talked days after and I became quite proud of myself. I acted as the mature friend, given that BKK is way older than me. I held my disappointment because BKK kept on defending herself. She claims to be innocent. According to BKK, her only mistake was she underestimated her other friends. She never realized that her other friends are capable of staging that grand chaos. What BKK failed to realize, she broke her promise. She ruined our agreement of keeping everything as a secret. God, I give up. BKK was more concerned with her innocence than my welfare. As it appears, everything now boils down to me and my big mouth. I'm the mastermind. I'm the root cause of all the chaos. After this experience, MFA and I shared the realization that it will only take one person to unlock any secret. Unfortunately, the one person can sometimes be in the shoes of your most trusted friend. 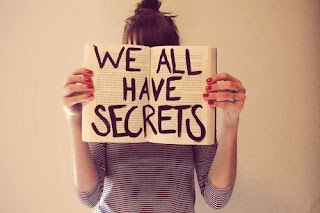 Once a secret reaches another person, you lose control. You are no longer the owner of that hidden piece of information. And like any other property owner, those who own it possess the freedom to do anything with it. Next time, I believe that the question is no longer limited to, can you keep it a secret? Will you be responsible co-owner the of the secret? If you cling on to the past, you are most likely depressed. It wasn't the exact words, but I encountered a quote expressing the said message a few weeks ago. It hit me because I knew that part of it describes me. 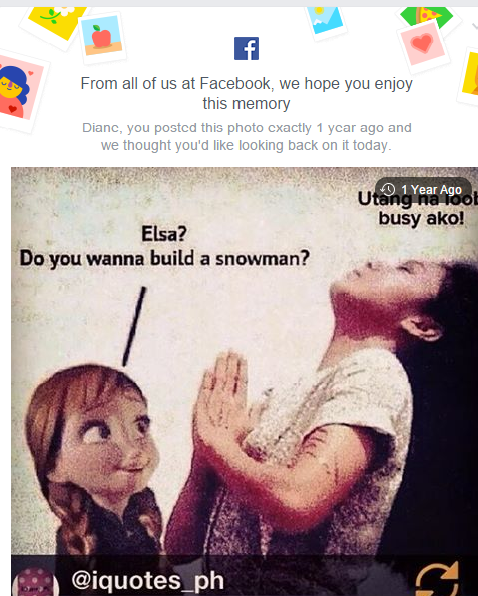 One thing I never thought I would appreciate about Facebook is its capability to capture and preserve memories. I have been in Facebok for as long as I can't remember. I checked my photo uploads and found entries since 2008. Although I believe I signed up earlier, back when Friendster was more famous. I started to explore Facebook when access to Friendster was restricted at the workplace (finding a new place to steal office hours haha) and a cousin from Canada sent me an invite. When Facebook became popular, you can easily sense the next victim of the workplace's restricted access policy. When this happened, I believe this also gave me the opportunity to regain interest in blogging. Much to my relief, blogging didn't become a trend among my colleagues. Hahaha Otherwise, I wouldn't be here for almost five years. 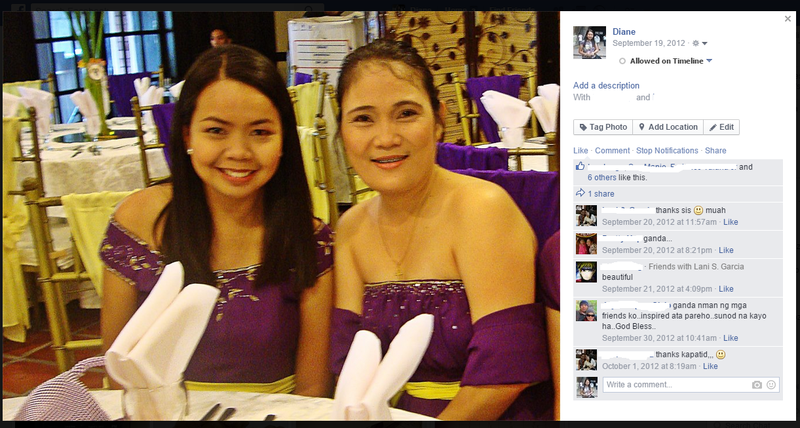 Recently, I noticed a new feature embedded in Facebook. I'm given an everyday notification of my past activities. Mostly are status messages and photo uploads. There were days when I would scroll down entries from my timeline. The recent feature made things easier. I'm given my daily source of memories. 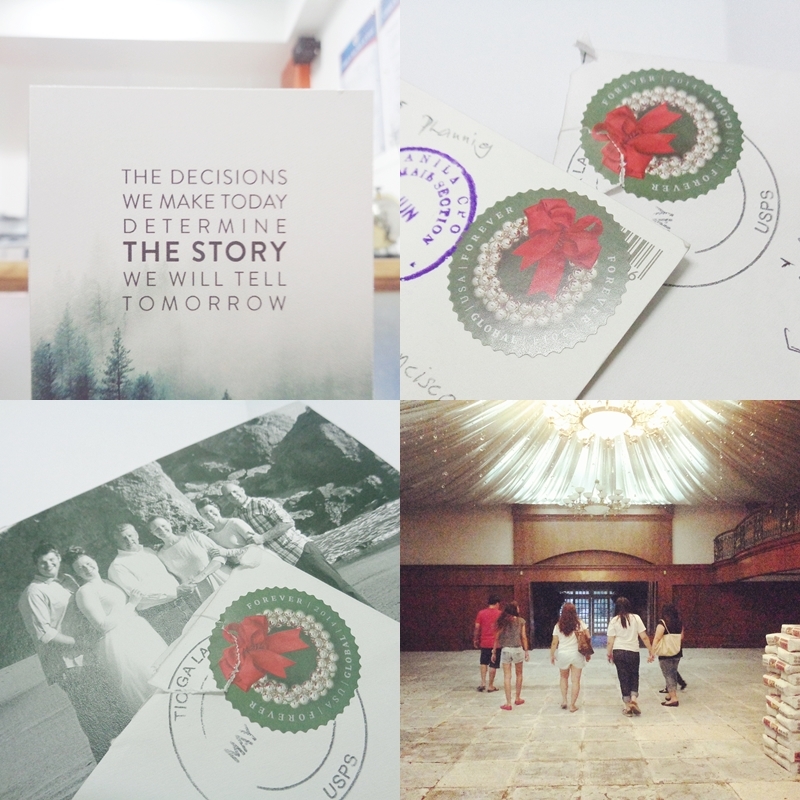 Moments of struggles, lowest points to simple accomplishments, rare times with good friends to my favorite family reunions and celebrations. My first time in Disneyland HK. How perfect because I was able to see my favorite Disney princess. While everyone prefers Cinderella, I have always been fascinated with Belle. That one great project - I wouldn't deny, I miss all the pressures and challenges. I never gave up to the last second. 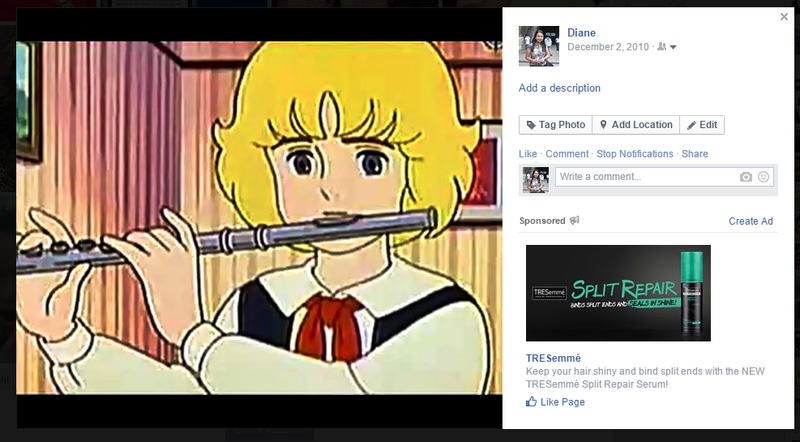 There was a time when everyone at Facebook changed their profile pic to their favorite cartoon character. Being the kid at heart, I joined the call. I was once addicted to button down long sleeves blouses. I was lbs lighter and the fit still looks great on me. Fast forward now, I stopped buying and wearing long sleeves tops. I look wider and heavier. 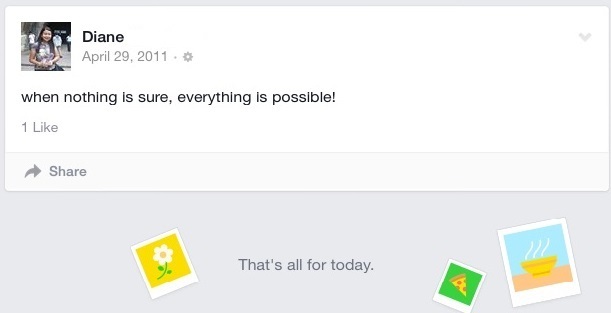 Status message that made me think for a while :) It took me some time to figure out the reason behind this. This one, I can't recall what really happened. And Oh, this one! (Hello AC!) This gave me some great memories. Ever since this feature appeared in my account, I usually start or end my day looking forward for this notification. I would like to believe that I was more active in Facebook several years ago. Over the recent years, I don't know if I outgrew photo uploads and status messages. I'm more than entertained browsing my newsfeed, scrolling down my Instagram and Twitter accounts. 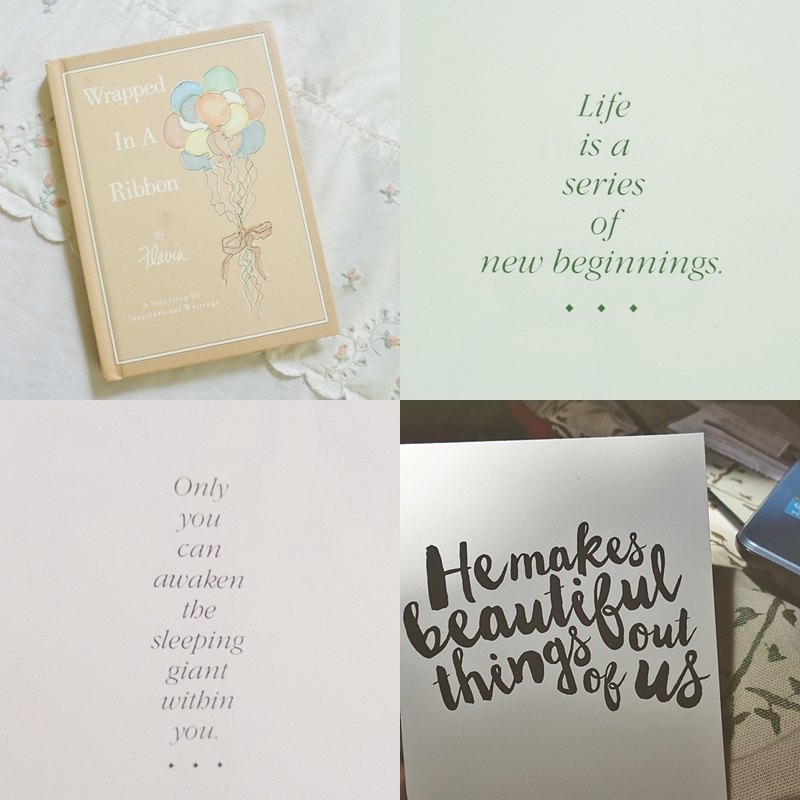 Added to this, I think I have become more attached with my blog. Maybe it has something to do with the fact that I'm semi-anonymous here. Hence, I'm more comfortable expressing my sentiments here. Most of the people who know me in the blogosphere are not part of my immediate environment. My colleagues and my students are not aware of my blog. My few colleagues turned friends who know my blog are the lazy netizens. Being the supportive friends, they don't really read my blog. Haha I guess everything boils down to the fact that there's more freedom of speech here. I started this post trying to figure out trying to establish the reality behind the quote I've encountered. Along the way, I got carried away reminiscing the good old days. Not that I want to bring back the past. Like what I said in my previous posts, I wanted to fill the next days with better and happier memories.